Bridgeport — On a waterfront crowded with stories of disappointment and promise, some dating back to his first tenure in city hall here in the 1990s, Mayor Joseph P. Ganim jumped on the back of a pickup truck Monday to accept the endorsement by four trade unions of a campaign that is testing the notion of whether Connecticut is ready to elect an ex-con as governor. The truck was parked inside a cavernous shed where one boatyard used to overhaul ocean-going yachts and ferries, only to go bankrupt six years ago. But a new boatyard is coming, waterfront housing is under construction, and the possibility of a casino resort is just over the horizon. Ganim, wearing jeans and a dress shirt, promised good times are coming. “I won’t let you down,” Ganim said. Some of the union leaders with Ganim go back to the 1990s, when the mayor helped steer the city away from bankruptcy and presided over major public-private construction projects: an arena and minor-league ballpark on the other side of the harbor, and a revamped community college campus bankrolled by the state and backed by a supportive governor. Nate Brown of the Operating Engineers said the presence of some of the labor men Monday was an expression of gratitude for the construction jobs they saw here once and hope to see again. But they are realistic on the question of whether Ganim, an able retail politician waging a class war against the party’s wealthy endorsed candidate, Ned Lamont of Greenwich, can win suburban votes. The trades also are grateful to Gov. Dannel P. Malloy, who is leaving office as one of the most unpopular governors in the U.S., but only after pushing the state to spend on transportation projects like a New Britain-to-Hartford busway and a commuter rail line from Springfield to Hartford to New Haven. About 850 of Local 478’s Operating Engineers were out of work in August eight years ago. Today, Brown said, there are fewer than 100. For the trades, that is a grade that counts above all others. Endorsing Ganim on Monday were: the International Brotherhood of Electrical Workers Local 488; the International Union of Operating Engineers Local 30, the International Union of Operating Engineers Local 478 and the United Association of Plumbers and Pipe fitters, Local 777. But the vast majority of labor, and delegates to the Democratic party’s state convention, have kept their distance from Ganim. 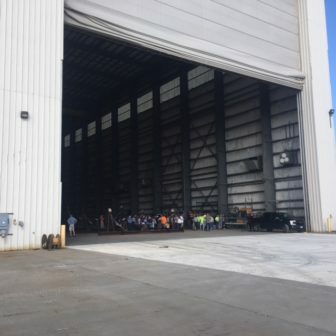 Ganim looked for a lift Monday in a boat shed that used to launch huge ocean-going yachts. The state’s labor federation, the Connecticut AFL-CIO, and delegates to the Democratic convention have all but pleaded with Ganim to go away. Their reasoning is that Ganim might have surprised the state by returning to city hall in 2015, but would be a disaster in an open race for governor that is judged, under the best of circumstances, no better than a toss-up for Democrats. In a five-way straw poll on April 6, the delegates to an AFL-CIO political convention ranked Ganim sixth, with just 6.6 percent of the vote. The option of “no one at this time” finished fifth with 9.5 percent. In May, delegates to the Democratic convention denied him the 15 percent margin necessary to qualify for a primary against Lamont — an unthinkable rebuke for the mayor of Connecticut’s largest city if he was not burdened by a criminal record. But Ganim is resilient. He asked for a second chance and qualified for the primary with a petition drive centered in Bridgeport, Hartford, New Haven and Waterbury. Ganim, 58, was elected mayor in 1991, serving for not quite a dozen years in city hall before a federal jury convicted him in April 2003 on 16 counts related to what prosecutors described as a systematic, 5-year scheme to extort kickbacks from nearly anyone doing business with the city of Bridgeport. He testified under oath that he was innocent. A jury didn’t believe him, and neither did the judge who sentenced him to prison for nine years. Ganim served seven, returning to Connecticut in 2010. The Supreme Court blocked him from resuming the practice of law, but voters of Bridgeport were more forgiving, returning him to city hall in 2015. Ganim has tormented Lamont, who is self-funding his campaign, challenging him to voluntarily limit his spending on the primary and to make substantial disclosures about his wealth and income in the name of transparency. Lamont’s campaign manager, Marc Bradley, professed to be incredulous last week at Ganim trying to claim the high ground on an ethical issue. On Monday, Ganim tweaked Lamont for refusing to commit to supporting Ganim should he win the primary on Aug. 14. He also said Lamont seems uncertain on a proposal to seek a law authorizing the expansion of casino gambling to the waterfront where Ganim stood. Lamont’s campaign said he is open to a casino as part of a larger resort. Ganim called his challenge of Lamont a “family fight” that should not divide the party once the returns come in Aug. 14. 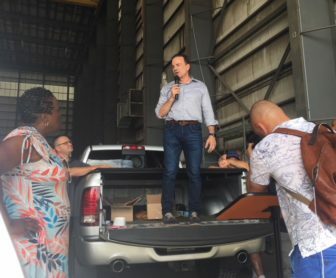 “When this family fight is over at 8:05 on August 14, and the majority of Democrats come out to vote — grass roots come out — we need to be united as a party,” Ganim said. Ganim said he was a grass-roots candidate, not someone backed by insiders and “party bosses.” He then glanced to his mentor, Mario Testa, an old-style party boss watching from the edge of the crowd and lightly said no disrespect was intended. The jab was aimed at Lamont, not Testa.